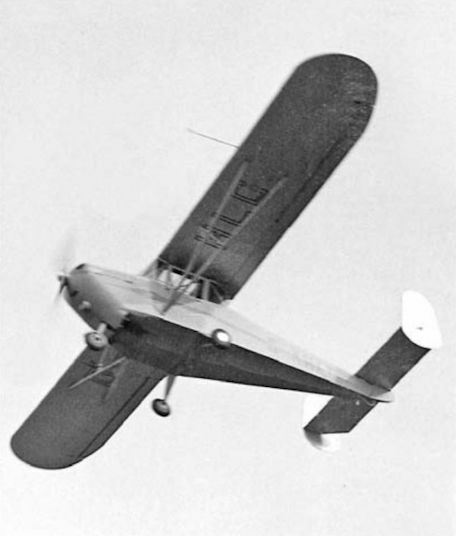 The prototype four-seat C.H.3 Series 1 Ace, with a 93 kW (125 hp) Lycoming engine, first flew in August 1946. 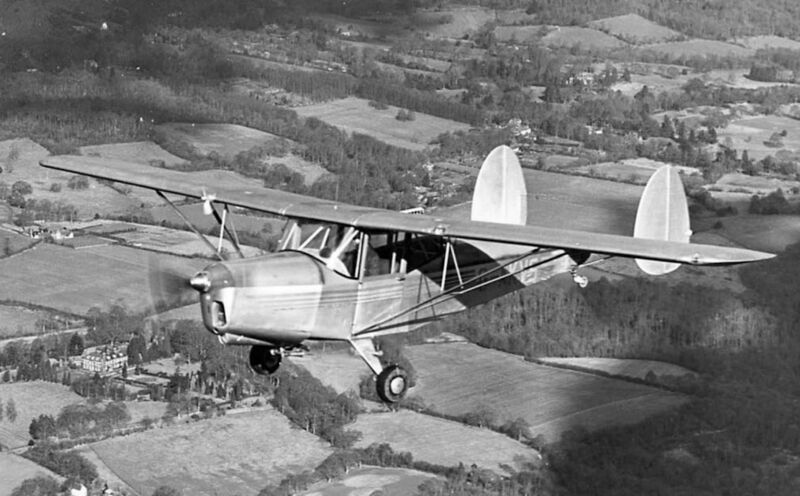 The production version, as the all-metal Series 2 Super Ace with a 108 kW (145 ДальшеMore>>> hp) de Havilland Gipsy Major 10 engine, was relatively unsuccessful (26 built, including Skyjeeps). Development of the Super Ace designed originally for military AOP duties. 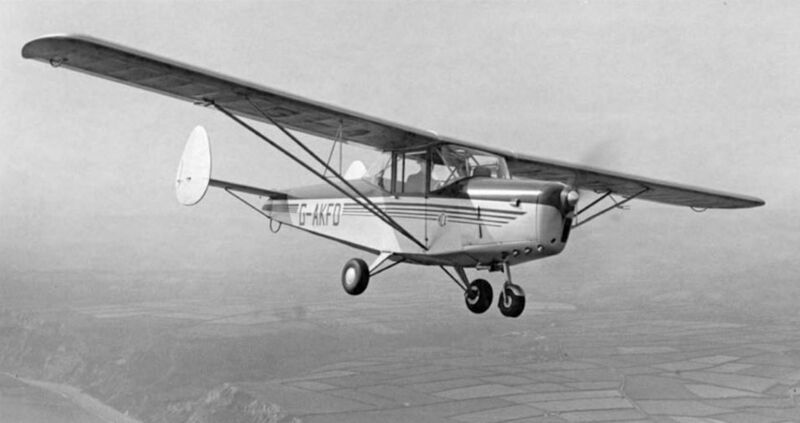 Luxury version of the civil Series 3 Super Ace with enlarged cabin and other improvements, first flown in 1949. 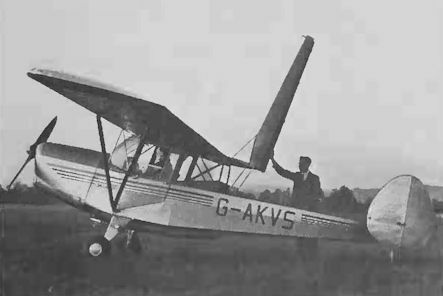 The sole CH.3 Series 1 Ace, G-AHLG, in its original configuration with a single fin and rudder. The large cabin, around which the aircraft had largely been designed, created turbulent airflow which tended to blanket the tail surfaces at low speeds. Test pilot Rex Stedman had considerable difficulty making turns during early flights. 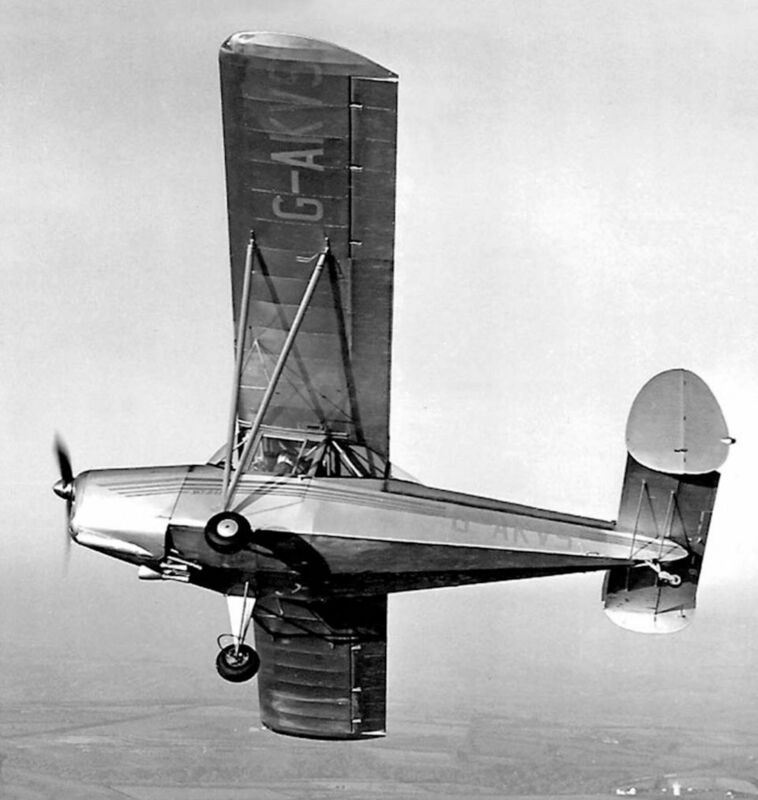 Within three weeks of its first flight the Ace had been fitted with twin fins and rudders and the dihedral of the wings had been reduced. The aircraft was ultimately withdrawn from use in January 1949 and scrapped at Exeter in the spring of 1952. A series of publicity photographs of the Ace, showing its novel features, including (left) the simple cabin, unusual “steering-wheel” flying controls and door designed for easy access, and (right) the car-type upper cowl­ing, hinged around a line on the starboard side. The lower cowling could be quickly detached as a complete unit. The prototype CH.3 Series 2 Super Ace, G-AKFD, initially retained the Chrislea control system but was ultimately fitted with a standard rudder bar, as were the majority of production Super Aces. The prototype was crated for Australia in March 1949 as VH-BRP, but was destroyed in a ship fire at Port Said a few weeks later. Chrislea C.H.3 Series 3 Super Ace. Donald Lowry, who took over from Rex Stedman as Chrislea's test pilot in 1949, also assumed the role of sales and publicity manager for the company. The first batch of nine Super Aces lined up at Exeter in the summer of 1948. Chrislea announced that ‘‘as soon as the material supply position improves, it is hoped to put the next batch in hand” and that “over­seas interest in the machine has been encouraging”. 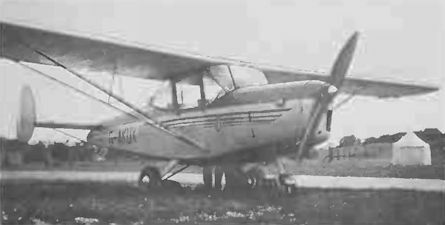 The prototype CH.3 Series 4 Skyjeep G-AKVS with its original smaller fins in 1949. The hinged rear decking opened up to reveal a compartment fitted with special rails and support-carrying rollers, into which a stretcher could be fitted. A medical attendant would have sat with the pilot in the front cabin. 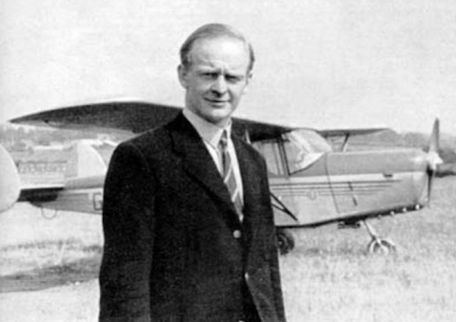 Chrislea C.H.3 Series 4 Skyjeep. 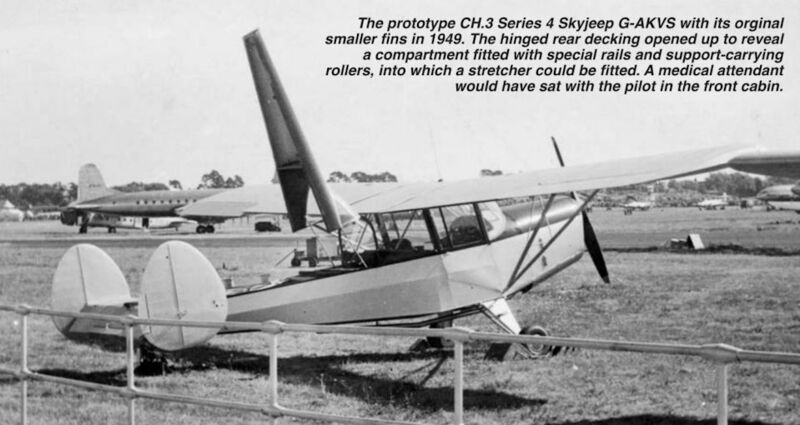 CHRISLEA SKYJEEP four-seater, also at Bankstown, has strengthened airframe and 200-h.p. D.H. Gipsy Six in place of 155-h.p. Cirrus Major III. In background is a Wackett trainer . 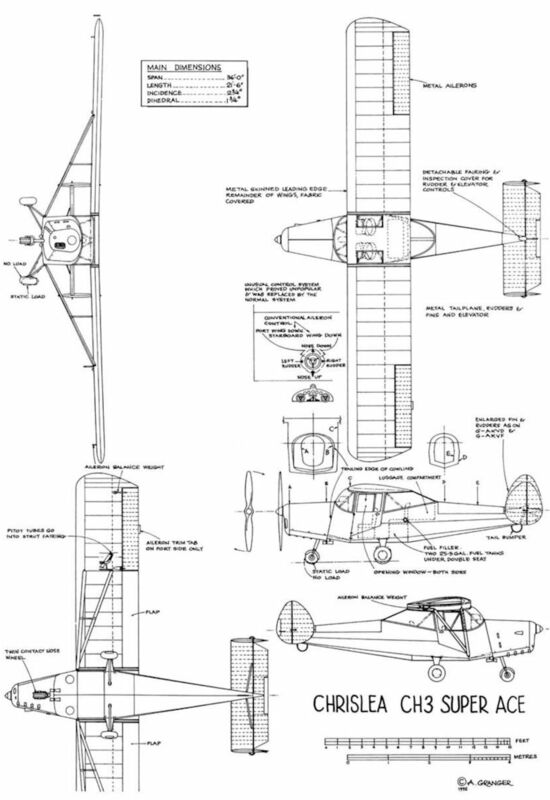 The C.H.3 Srs. 4 (VH-RCD) is cream and red. SEEING IS BELIEVING. Australia provide unusual conversion. The tail wheel undercarriage Chrislea C.H.3 Srs. 4 Skyjeep (VH-RCD) four-seater now has a deepened rear fuselage. 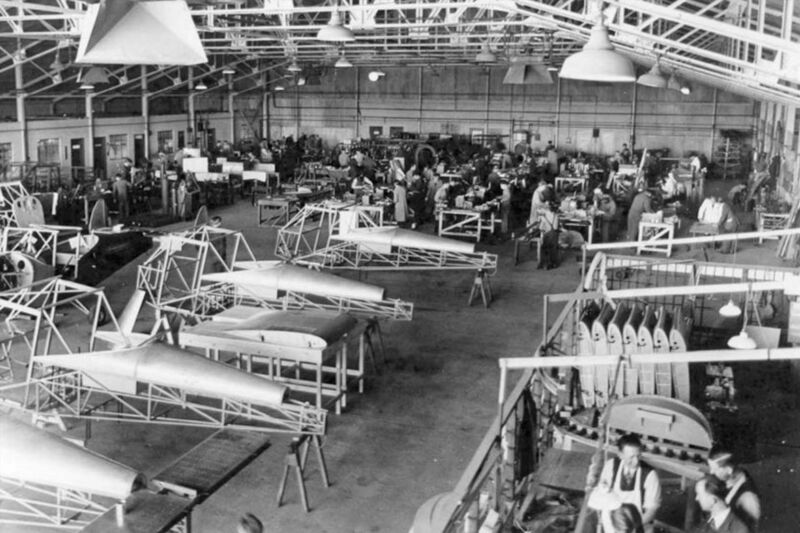 The Series 2 Super Ace production line at Exeter in April 1948. By the summer of that year, all was not well at Chrislea and the factory was closed for two months owing to ‘‘material shortages”, a result of financial difficulties with the company’s suppliers. 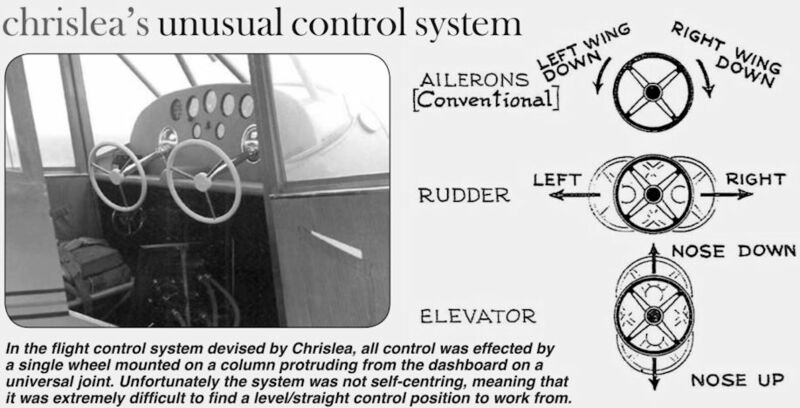 In the flight control system devised by Chrislea, all control was effected by a single wheel mounted on a column protruding from the dashboard on a universal joint. Unfortunately the system was not self-centring, meaning that it was extremely difficult to find a level/straight control position to work from.